Places of attraction: Located at the edge of Indian southern peninsula, Kanyakumari is a major pilgrimage town in the state of Tamil Nadu. Being a point of intersection of Bay of Bengal, Indian Ocean and Arabian Sea, Kanyakumari serves to be a major tourist destination offering several places of interest to the tourists. Kanyakumari Temple: Also known as Kumari Amman, Kanyakumari Temple is prominent place of worship in Kanyakumari. The temple is dedicated to Goddess Durga and is one of the Shakti Peethas. 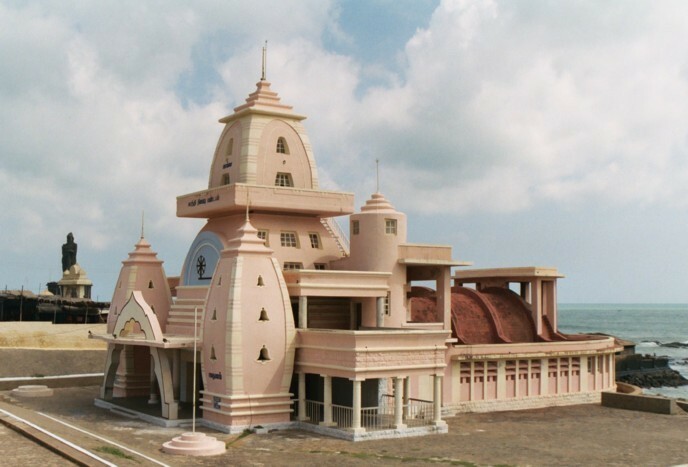 Situated on the shores of the sea, the temple is visited by a number of devotees and the tourists alike. The name of Kanyakumari town is said to have derived from this temple. 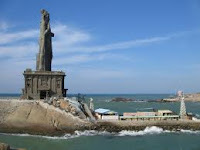 Vivekananda Rock Memorial: It serves to be a major place of attraction in Kanyakumari. It is perched on a rock just 500m off the main Island. Vivekananda Rock memorial was constructed in 1970 to commemorate the visit of Swami Vivekananda to the place in 1892. When Swami Vivekananda visited Kanyakumari in 1892, he swam to the rock and spent all the night meditating there. The memorial contains a statue of Vivekananda and a meditation hall. Gandhi Memorial: Gandhi memorial is another place of interest in Kanyakumari. The memorial was inaugurated on the birth anniversary of Mahatma Gandhi on 2nd October in 1956. It is here that the ashes of Mahatma Gandhi were kept before immersion. The central height of the monument is 79 feet which represents the age of Mahatma Gandhi at the time of his death. Apart from above mentioned places, Kanyakumari also houses many other places of interest in and around it. Courtallam Falls, Thiruvalluvar Statue, Keeriparai and Lord Subramanyam Temple are some of the prominent places of attraction to be visited in and around Kanyakumari.